Cindy-Lou is a very nosey five-year-old cat who likes to sniff out new people, but unfortunately doesn't trust anyone but me. She's almost guaranteed to swat at my friends when they try to pat her (bad kitty!). 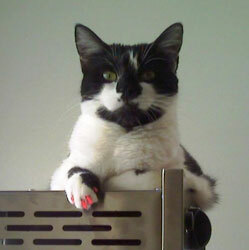 Thankfully, the Soft Paws prevent her from drawing blood. 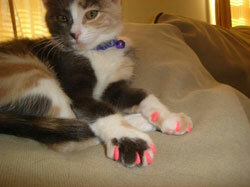 I purchased Soft Paws for my new kitty, Daisy. 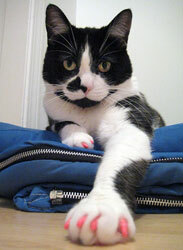 I already was clipping her claws, so she was used to me touching her paws. I was shocked how easy it was to apply the claw covers. AND, she totally ignored them. I have been very pleased. 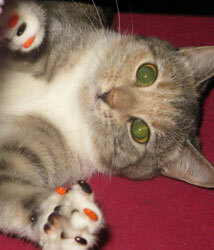 Here is our little Maui looking fabulous in her Soft Paws! Just wanted to thank you for making such an awesome product and the fast and easy service makes all of our lives, including Maui's, much easier! He doesn't look like it in the picture, but Monster lives up to his name. Thank God for your product. Now the drapes are safe again! I just wanted to thank you guys so much for this wonderful product! I have two cats and they were destroying my house and I didn’t have the heart to take away their claws after they have had them for 2 years already. 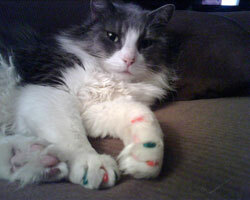 Sparkles (pictured) is a very intelligent cat and I thought for sure that he would chew them off… 4 weeks later he still has them and hasn’t chewed even one off! 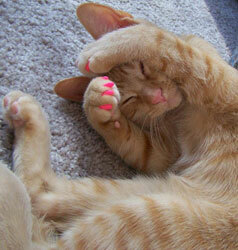 We love Soft Paws! Frowzy (fro-zie) and her Christmas toes! I had my doubts when I bought these, but they stay on! I adopted her when she was three and a half years old. I didn't want to de-claw her but also didn't want her tearing up my house. She let me put them on the day I brought her home and she hasn't been without them since! 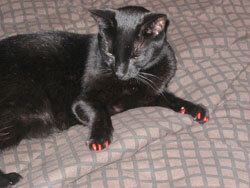 Everyone thinks my precious Fuzzy has her nails done... well... she does! 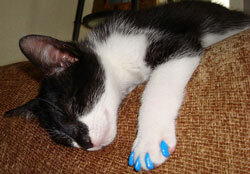 We love Soft Paws for kitten. We have been using them since he was a few months old and it has saved us a lot of cuts, scratches and damaged furniture. First, let me give you background on my cat. 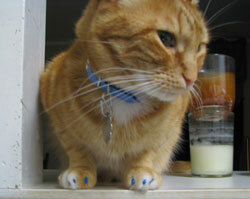 My cat, Oscar, and I rode out Hurricane Katrina at our home in Metairie LA. He was trapped under a box spring when my home collapsed during the storm. He wasn’t hurt, just in the space there. We found him within the hour and found shelter in an empty apartment across the way. When I was able to evacuate, I was not allowed to take him with me. I put lots of food and water for him and left him in the empty apt. When I came back for him a few days later, he was so shaken that he now has "kitty cat ptsd" (if there is such a thing). To this day, he follows me from room to room and refuses to be left alone. He has also become extremely fearful of strangers, noises and weather changes. He not only fearful, but will become very aggressive with anyone he views as a threat. Once my son came to visit and even though he and Oscar know each other well, when my son and I were play fighting, Oscar attacked him. If my fiancé and I argue, Oscar stands between us and hisses at him. It’s really weird. 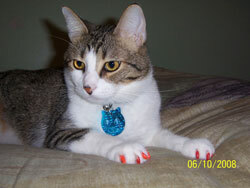 We thought about declawing him, but I was against it as Oscar is about 8 yrs old and I just feel it's wrong. How would I feel if my fingertips were cut off?!? 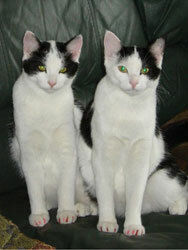 I applied the Soft Paws and they have saved me. Now he doesn’t draw blood when he plays, and other people won’t have to be so afraid of him. Audrey is a new addition to our family, and she joins a Greyhound and a declawed Abyssinian – she took to the Soft Paws readily, and agrees that she looks very sweet in them. We use these on the Grey (to protect the wood floors), our black and white sweetheart, and the rear claws of our beloved Abby Rusty—they work great on all of them! 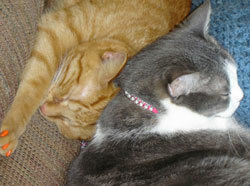 This is Milo and Daisy sleeping. 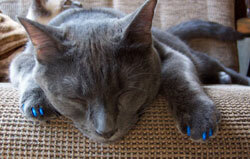 Soft Paws have been a wonderful solution to scratching, especially the screens in our windows and doors. The cats don't mind wearing them at all. Thank you! 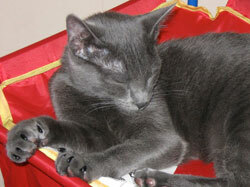 Here is a picture of my 15 week old kitten, Mistletoe, she loves her Soft Paws! Toulouse in her Halloween Soft Paws. 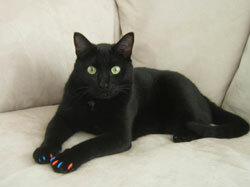 Just wanted to send pictures of our cat Obie wearing his Soft Paws. We love them.